This necklace consists of a central pendant and two rectangular mosaic pieces strung on three strands of graduated jet heishi. The design motif of this necklace is what is known as the Anasazi Window (see the last photo in this gallery). 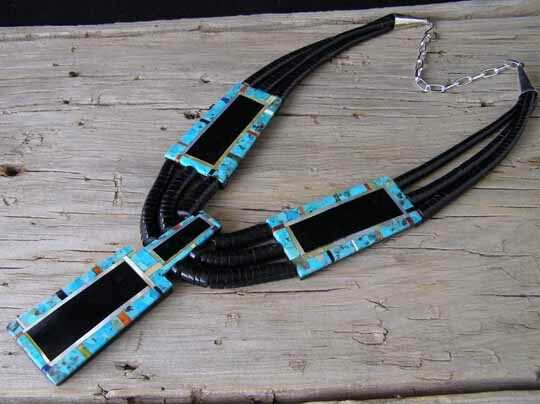 Delbert used a variety of materials to create this design, with the actual windows made of jet framed by mother of pearl shell with a border of Kingman turquoise. Other materials used to make smaller stripes of mosaic tiles are apple coral, green serpentine, melon shell, lapis lazuli, white clam shell and sugilite. The mosaic work is done on a foundation of jet. A five-inch extension chain allows for adjustment of the length. Rectangular mosaics: 3" x 1 5/8"